The idea of a holiday wedding is hard to ignore, especially if you're a person who needs and easy way to remember your anniversary. But remember that you're not even close to the only ones getting married in Las Vegas that day. Dates like Valentine's Day book up fast. And if the romance overwhelms you and you just have to hit up one our local wedding chapels on the most romantic day of the year, you might find yourself standing in line with all the other couples squirming to turn Valentine's Day into their wedding night. Even holidays like New Year's Eve can be complicated. The Las Vegas Strip is flooded with tourists, making booking hotel rooms for your guests a chore. And reception venues like restaurants and clubs will be crowded as well. We're not saying we don't want you here for each and every holiday. We definitely do. We just don't want you to be surprised by the fact that we can't be exclusive with you. That's just not how we roll. If you're more the type to plan things in advance, and expect a large number of guests for your wedding, consider booking a Las Vegas hotel chapel. These locations have packages that include caterer, flowers, music, photography and more. And it's all in-house, so you don't have to go searching for different vendors. They even have wedding coordinators to help you with all the arrangements. You'll save money on transportation to and from the wedding venues without running the risk of grandma getting lost or uncle Larry getting distracted by the slots. And if you're prepared enough to book a hotel chapel, be sure to tell your guests about it. Send save-the-date cards with the hotel, transportation and all other pertinent information well ahead of time so your guests can plan for things like airfare and time off from work. So you're that couple that wants a wedding no one has ever thought of before and no one will ever be able to copy. You don't have to twist our arm to do something crazy. If you've got an unusual wedding plan, or just a general idea for something you'd like to try, chances are there's someone in this town willing to create a unique wedding for you. 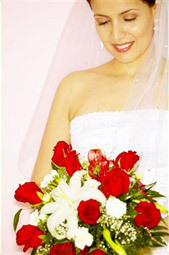 Contacting a Las Vegas wedding chapel or wedding planner can make your twisted dreams a reality. Don't be afraid to ask the crazy questions! We hope we don't have to remind anyone that Las Vegas is in the desert; but just in case you forgot, deserts are hot in the summer. Formal wear, makeup, cakes and standing outside while the best man rambles on about the good old days can take their toll. If you're planning to have any part of your wedding or reception outdoors, consider booking during spring or fall or just waiting until nighttime to move outside – the lights make it more magical anyway. Despite our reputation, Las Vegas doesn't just give it up to anyone when it comes to getting married. You still need a marriage application. Thankfully, couples can speed up the process by filling out their marriage application in advance and bringing the completed application with them. The form must be submitted in person and applications and marriage license instructions are available on the marriage bureau's website. Are you joining us from another country? Make sure you know the legalities in your home country. We'd hate for you to have to deal with paperwork right after your honeymoon – you'll probably be tired. It's pretty rare for a country to not recognize a marriage performed in Las Vegas. But sometimes they require a little extra information. For example, British citizens must provide formal notification of an overseas marriage with the General Register Office (GRO) by depositing a certified copy of their marriage certificate and an Apostille from the Nevada Secretary of State. Interested in spending less on your wedding so there's more for the marriage? Book your wedding during the off-season. Search for local vendors and call casinos and hotels to find out what time of the year their rates are the lowest. Las Vegas is the place for spur-of-the-moment weddings. So it makes sense that wedding dress rentals are available. If your special day happens to be whatever day you feel like getting married, finding a dress doesn't have to be a hassle or huge expense. And consider going sleeveless if it's in the summer. From Paris to the Palazzo, Las Vegas really is an international city. So don't worry if you don't speak English. Many wedding chapels in Las Vegas will perform ceremonies in Spanish, French, Italian, German, Japanese and other languages. Check out our hotel chapel guide to find chapels that offer foreign language ceremonies. If your wedding is spontaneous, or you just want to upgrade your bling at the last minute, numerous jewelry stores around the city and in hotels offer a wide range of pricing options for rings or other wedding jewelry. Tiffany's in The Shops at Crystals even has a special room overlooking the Las Vegas Strip where you can pop the question. Many of the stores have extended hours to accommodate weddings at any time of the day. Hotel buffets are a great way to feed a large group without many of the usual hassles like choosing a menu or convincing your new father-in-law to at least try the fried tofu appetizers. Reserve a private room and let your guests indulge themselves at some of the best buffets in the world. If your wedding package doesn't include a cake, or you want something a little more extravagant or special, sample some of the luxury chocolate stores in town like Bellagio Pâtisserie or check out Carlo's Bakery by Buddy Valastro of "Cake Boss" fame inside The Venetian. Don't worry about breaking your wedding budget. Sure these chocolatiers and bakers create amazing one-of-a-kind wonders, but they also have pre-made cakes available on short notice and at alower price then the custom masterpieces. Hotel convention and catering staffs can also provide cakes or you can ask your hotel concierge for some suggestions on local bakeries. For smaller receptions, booking a hotel suite instead of a reception hall can save a lot of money. And you have the added bonus of having the room all night so your guests can sleep, dance or do anything else that consenting adults have been known to do following weddings. You've got to look perfect for your wedding day. And you don't need to feel guilty about that. Most large hotels have a spa and/or salon on site that can help you with hair, makeup, manicures, pedicures and more before your big day. You also might want to try a local salon off the Strip if you're on a tight budget. Either way, be conscious of holidays and weekends. Salons book up fast and we'd hate to see you looking anything other than spectacular. We may be known for weddings, but we think honeymoons are just as important. Our hotels have some of the most magnificent suites in the world. Sleep (or don't sleep) in style with gorgeous views of the city, whirlpool tubs and much more. Any hotel concierge can also help set up romantic touches in your room like strawberries, champagne, rose petals or whipped cream. To feel the love from the whole town, throw on a couple of "Just Married" T-shirts and hit Sin City's most talked about bars and nightclubs. You may just score yourself some free drinks! But don't try this trick without getting married first. You're on the honor system!